The goal of advertising is to make a business money, but conflicts of interest are all too common. Agencies talk a big game about protecting their clients’ long-term interests, but many agencies fail to serve their clients first when their financial incentives don’t align. As a marketer, you need to know your agency’s potential conflicts of interest to make sure you’re getting the results you’re paying for. At the root of agency conflicts of interest is a historical payment system based on percentage of ad spends. That motivates agencies to increase their revenue by spending more on paid advertising. The biggest culprits include display advertising fraud, pay-per-click (PPC) advertising, and commission-based affiliate marketing. Display advertising fraud is a huge issue. Advertisers devote billions of dollars to online display ads, often purchased “programmatically” or through buying software that automatically places ads on sites that fit a brand’s media plan. However, at least 36% of clicks from display ads may be fake. So, marketers not only pay a lot of money for worthless traffic, but agencies also have little motivation to fight fraud—they’re compensated on a percentage of spend and want increased volume. Networks that reduce fraud also tend to have lower available impressions, meaning they often lose the largest buyers’ business. The PPC model also can compromise agency integrity. Many agencies managing PPC on behalf of brands charge a percentage of spend without any tie to ROI, which financially motivates them to continue to spend more on campaigns. In theory, this model benefits clients and agencies. Clients want large campaigns that generate a lot of revenue, and agencies want large campaigns to increase their percentage of spend yield. However, in practice, this incentivizes against cost-efficient campaigns. Even if a customer could attract the same amount of revenue with a smaller ad spend, the agency may keep ad spend high to protect its profits. Finally, affiliate networks and affiliate program management services have a conflict of interest based on their business model. Rather than charge a standard fee for tracking services, large affiliate networks generally earn fees as a percentage of affiliates’ paid commissions or total sales. What marketers may not realize is that these same networks have publisher development teams that work with affiliates to increase sales and commissions with their advertisers. As more affiliate revenue is generated and higher commissions are earned, the network and the affiliate benefit. It’s like having Google managing your PPC spend. For example, when Bitly partnered with VigLink earlier this year, there were major implications for many affiliate marketing programs. Bitly, a URL-shortening service, generates 8 billion clicks per month and is used by both bloggers and many companies’ social media departments. But the new partnership replaced these direct links with VigLink links, meaning revenue from resulting sales went to VigLink and Bitly when a payment normally would not have been issued. Very few affiliate networks, if any, notified their clients because they had no incentive to do so. In contrast, independent agencies (not tied to the same financial metrics) were very vocal in warning clients about this change and were quick to publish articles and create awareness. Those agencies acted in the best interest of their clients because there was an incentive to do so. Be aware of these conflicts of interest. Strongly reconsider paying your agency based on a percentage of spend. Here are three steps you can take to align agency incentives and behaviors. Just as you wouldn’t buy a car without researching prices, you shouldn’t accept an agency’s ad spend proposal without understanding where your money is going. It’s up to you to know enough to protect yourself. For example, did you know that display advertising vendors often mark up media buys by 50% or more? Research will enable you to confidently ask the right questions. Stay up to date on industry practices, and have frank discussions with your agency about how it spends your money and earns its own. 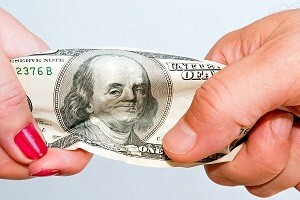 The best agencies incentivize employees to treat your money like their own. Your account manager’s pay shouldn’t depend on your ad spend. Rather than pay your agency a percentage of ad spend, look for an agency with a flat fee or “return on ad spend” revenue model. Paying a fixed fee encourages the agency to increase profits by keeping costs down and ensures you won’t spend more than you bargained for. The ROAS (return on advertising spend) model ties an agency’s profit to hitting growth and efficiency targets, and motivates it to take ownership of your goals. You need to know where your partners make their money. When companies promote partner products or networks, ethical questions can get murky. If your agency is double-dipping, you could pay the price. Markups and kickbacks should be affirmatively disclosed. We had a client who left his agency and was approached directly by a provider who had been working through the agency. The provider offered its tool for 25% of what the client had been paying; the rest was a markup. State clearly to your agency that you don’t want it accepting gratuities from partner companies for spending your money with them. You deserve to know how your money is spent, and a reputable agency will care about decreasing your costs and increasing your ROI.